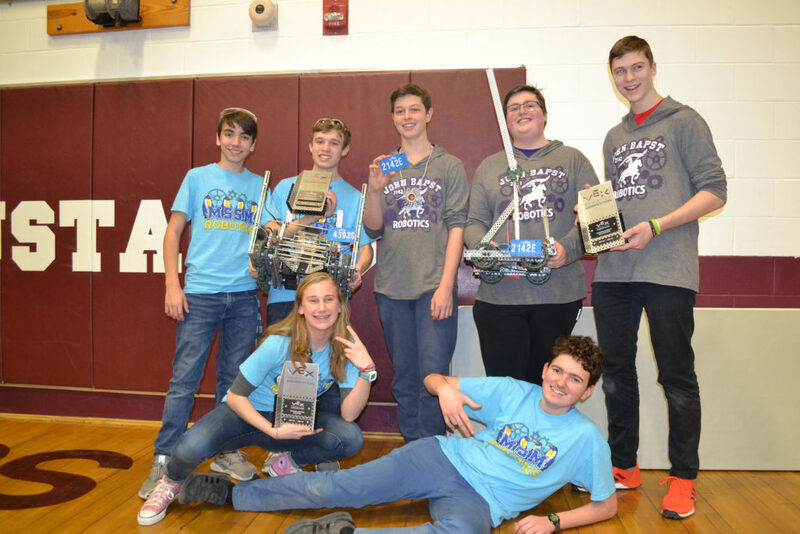 John Bapst Robotics teams have been battling their way to the top in the high school robotics landscape and will be headed for state next! John Bapst has been tournament champion at every tournament attended so far in the 2018-2019 season. 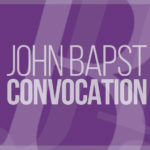 The Maine state competition in in two weeks (Feb 23rd) in South Portland. Matija Mamula ’18 and Evan Cardimino ’18 will be announcing at the event, which will possibly be live streaming. There were 30 teams from around the state in a tournament held in Monmouth on Saturday, from York all the way up to MSSM in Limestone. The first five hours of the tournament is filled with Qualifiers. In these matches, robot teams match up with a single partner, to compete against two other robots. The match ups are determined randomly by the event organizers. Each team is placed in between 8 and 10 qualifiers each tournament, and has that many matches to distinguish themselves with victories on the field. In the next part of a tournament- the Alliance Selection – all 30 teams line up with the top teams selecting one other team from the remaining teams to join them in the championship rounds. The selection goes from top team down. Following the Alliance Selection, a bracket-based single match elimination, if a team loses a match, they are done for the day. This continues until there is one alliance left standing. In Bapst’s first two meets this season Team 2142C (Logan Eckmann, Chris Chappelle and Neil Johnston) came away with the title of Tournament champion, not having lost a single match all tournament. In Bapst’s third meet Team 2142E (Elliot Collins, Hayden O’Connell, and Charlie Fussell) took the top prize, dethroning 2142C along side team 4393S from MSSM. In the Alliance selection process, MSSM was in 3rd place, and refused an alliance offer from top seeded Hampden. When it was their turn to select a partner, They chose 2142E, based on a lot of behind the scenes schmoozing. Hayden made a few quick modifications to their robot before the end, and the two teams made their way to emerge victorious again! There was some pre-planned strategy here, in that the week before the meet, 2142E decided to downgrade their robot and just have fun at the last regular season meet of the season. 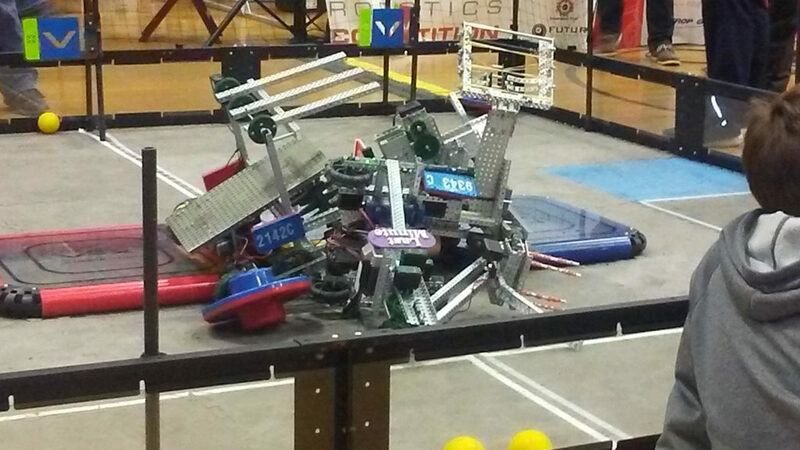 Their robot, by normal standards, would have been considered “a joke” but when it began winning on Saturday, they altered their strategy, and began reviving the old alliance with MSSM from January 26th, and reverted their design to the January 26th model, with the added vertical bar you can see in the photo. This was enough to keep them out of the limelight, but attractive enough to court MSSM’s selection. Also in the winners circle was our own 2142A team (Minh Kim and Brittany Ho, Captain Cecelia Zeamer (not present) with the Sportsmanship Award – a first for John Bapst.